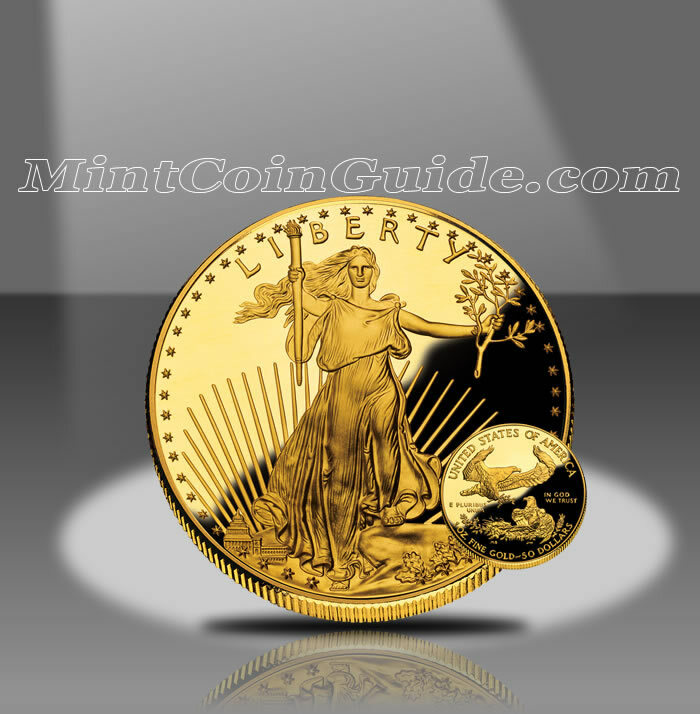 The 1990 American Gold Eagle Coins marked the fifth year in which the US Mint struck the precious metal coins. The coins were available in both proof and bullion varieties with four different sizes available in each – one ounce, 1/2 ounce, 1/4 ounce and 1/10 ounce. The coins featured a face value of $50, $25, $10 and $5, respectively, however, each coin’s intrinsic value was and is worth much more than their face value. For reference, the average price of an ounce of gold during the year came in at $383.51. This was a slight increase from the previous year of $2.07 an ounce. For the fourth consecutive year, the total number of the two largest sizes of Bullion Eagles sold had shown a decline from the previous year. 1990 also experienced a decline in interest for the two smallest sizes of the strikes. A total of 655,420 Bullion Eagles had been struck, a drop of 151,778 from 1989, or down 18.8%. Proof Eagle mintage saw across the board increases for the year including the number of 4-Coin Sets sold. The 1990 Gold Eagles were the fifth year in which the US Mint produced the coins. The US Mint sold the Gold Bullion Eagles through it’s network of authorized purchasers for a majority of the year. Bullion Gold Eagles were sold by the Mint’s network of authorized purchasers for a small premium above the spot price of the gold contained within them. The Proof Gold Eagles were sold directly by the Mint to the public for $570 for the One Ounce Gold Eagle, $285 for the 1/2 Ounce Gold Eagle, $150 for the 1/4 Ounce Gold Eagle and $70 for the 1/10 Ounce Gold Eagle. Both the US Mint’s facility in West Point and Philadelphia shared the responsibility for striking the Gold Eagles. However, the One Ounce Gold Proof Eagles were only struck in West Point and contain a ‘W’ mintmark while the fractional Proof Eagles were struck in Philadelphia and show the ‘P’ mintmark. The obverse (heads side) contains Augustus Saint-Gaudens’ Lady Liberty which was first featured on the Double Eagle coin from 1907-1933. Miley Busiek designed the family of eagles shown on the reverse (tails side).